Fighting boredom is something that everyone can relate to. Whether on a lengthy commute to work, stuck inside on a rainy day — you name it — downloading the Playster app is a great way to stay entertained and it comes with all kinds of benefits. For one, it brings together multiple media types in one simple app. 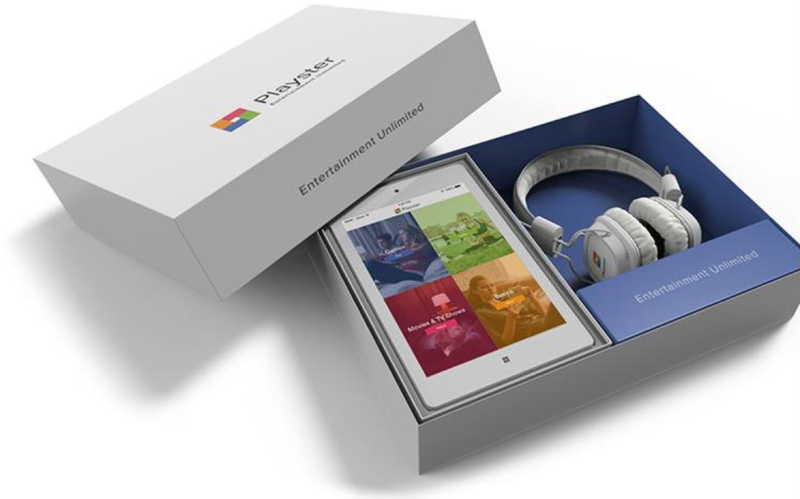 Music, movies, games, books and audiobooks — it’s all included in the Playster experience. Choosing the right streaming plan from Playster is easy — you just have to take a moment to consider what you are looking for. The yearly plan definitely offers the most value for money. In addition to receiving unlimited streaming for 12 months, when you sign up for a yearly plan with Playster, you will be able to take advantage of their free Combo Box offer. Let’s take a closer look at what’s included inside the Combo Box and how you can benefit from it while enjoying Playster. The first and most important thing in the free Combo Box is the Android tablet. This tablet features a seven-inch display and will allow you to watch your favorite movies, read the best books and play fun games from Playster’s library. There is also 16GB of internal storage and an SD card slot, which means you will not have to worry about maxing out the memory of your tablet. Getting an SD card with additional space on it will allow you to download all of the movies, music, games and audiobooks you want for offline enjoyment. This tablet also features Wi-Fi and Bluetooth capabilities, so you can stream media from anywhere with a good Internet connection and hook up wireless headphones to the tablet with ease. The next cool feature of the Combo Box is the pair of Playster headphones that’s included alongside the tablet. Whether you’re looking to listen to some music, give an audiobook a try or watch a movie with Playster, you will need a good set of headphones at your disposal. The headphones you receive as part of this promotion have a deep bass and crisp highs, offering a great sound. You will also be able to easily adjust them thanks to their inline controls and take them with you everywhere you go, as they fold into the size of a baseball for easy storage. The Combo Box also includes the adapter you’ll need to keep the tablet charged and ready for a trip at all times, as well as a USB Cable to help you transfer files with ease. Whether you want to upload music to your tablet or move content from your tablet to your computer or other mobile devices, you will be able to do so using this cable. In this manual, you will find all of the information you’ll need to use your new tablet and its accessories like a pro. The time you spend going through this type of paperwork will help elevate your Playster experience and will be well worth it in the long run. The Playster team has put together this bundle to reward loyal customers and show them how much they’re appreciated. Not only does the service offer a wide variety of music, movies, books and games, but being able to add a free Combo Box to your electronic bundle will ensure all the entertainment you could ever want is at your fingertips at all times for one low monthly price. The money that you pay — just $24.95 per month — for the membership is well worth it already and when you consider all of the added benefits that come with the Combo Box, it becomes one of the best deals in the world of streaming.